Sukiyaki is a very popular Japanese meal that is easy to prepare where the meats and vegetables used are similar to what is used in Shabu Shabu. It's easy to prepare because everything is made in one pot. There are different ways to prepare this dish and it is usually prepared different ways throughout different regions in Japan. It is a dish that typically consists of thinly sliced beef along with vegetables and other ingredients. In Tokyo, the preferred way to make sukiyaki is to stew the ingredients in a mixture of soy sauce, sugar, sake, and mirin. In Osaka, the meat is grilled first and then other ingredients are added and a liquid is poured into the pan. 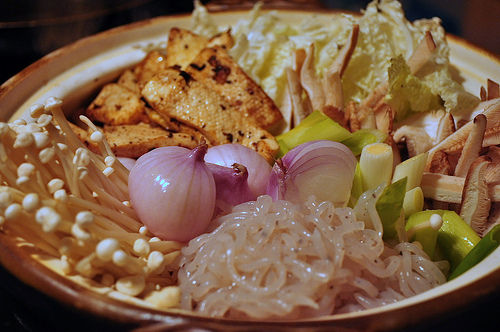 Ingredients that are typically added to a sukiyaki dish include tofu, negi (a type of scallion), leafy vegetables, mushrooms, and jelly noodles. When it's time to eat sukiyaki, a raw egg is beaten into the serving bowl (one egg per person being served) and ingredients that you remove from the pot are dipped into the raw egg. The reason for this is that the eggs add a richness and a silky texture. 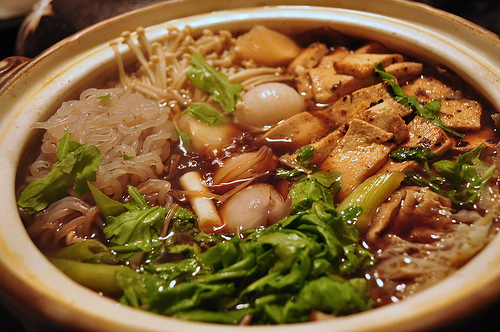 There are a number of stories about the origin of sukiyaki. One story involves a nobleman in medieval times who stopped at a peasants hut after a hunting trip. The nobleman ordered the peasant to cook his game but the peasant realized that his cooking utensils were not suitable for a noble. He cleaned his suki, or spade, and broiled (yaki) the meat on it. Another story is that peasants would cook sweet potatoes while they were working out in the fields. They would cook the sweet potatoes in their spades so that they would have less gear to carry with them. Japan was opened to foreigners in the 1860s and at this time new styles of cooking were introduced. Eggs and meat from cows were being widely used at this time and sukiyaki was a popular way to serve them. The first sukiyaki restaurant opened in 1862 in Yokohama and now there are many restaurants around the world serving this dish. Enoki mushrooms are much more than your average fungus.